For the 1970 song of the same name by Cat Stevens, see Tea for the Tillerman. "Hard Headed Woman" is a number 1 rock and roll song recorded by Elvis Presley and published by Gladys Music, Presley's publishing company, in 1958. It is an American 12-bar blues written by African American songwriter Claude Demetrius. 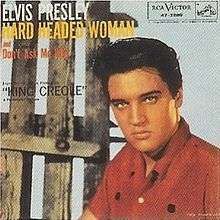 It was most notably recorded as a rock and roll song by Presley as part of the soundtrack for his 1958 motion picture King Creole, and was included on the record album of the same name. The song was also released as a single in both 78 RPM and 45 RPM formats. In 1958 it went to No. 1 on the Billboard charts and went to number two for two weeks on the R&B chart. It became the first rock and roll single to earn the RIAA designation of Gold Record. The song has also been recorded by Wanda Jackson, among others. Cat Stevens recorded a different song of the same name, on his album Tea for the Tillerman. ↑ Whitburn, Joel (2004). Top R&B/Hip-Hop Singles: 1942–2004. Record Research. p. 468. "What'd I Say" / "Viva Las Vegas"
"Ain't That Loving You Baby"
"Puppet on a String" / Wooden Heart"
"If You Talk In Your Sleep"